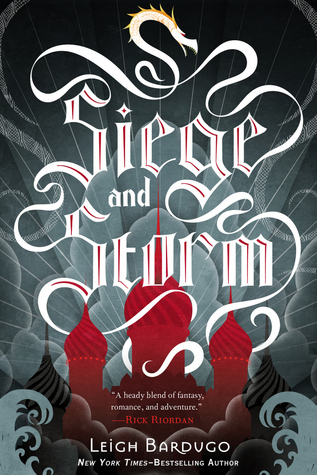 The Best Books Ever: Siege and Storm: Two Reviews! Siege and Storm: Two Reviews! Here's my review: WHEN IS THE THIRD BOOK COMING OUT, I WANT IT NOW. Before I start, this will be mildly spoiler-y for Shadow and Bone. I kept trying to write the review without spoilers and couldn't do it. So, skip this if you haven't read the first book in the series. It's rare for me to like a middle book in a series more than the first -- the first book establishes the world and the characters and makes you fall in love enough to get you invested in the rest of the series. The second has to bridge the gap and move the plot along for whatever big confrontation or revelation comes to light in the final book, and so second books suffer a lot from "good but kind of boring". While Siege and Storm wasn't non-stop action, it never felt boring, even when it delved into court politics and personal lives. (Of course, these are some of the things I love the most about books.) I think the reason it was so strong for me was because we really got to hone in on Alina learning to become a leader and continuing to own her power, without the Darkling manipulating her for his own purposes. We also get an excellent cast of new supporting characters who join Alina and Mal on their journey to escape the Darkling's reach, in addition to many returning faces from the first book, some of whom are much worse for wear after the Darkling's rebellion. Siblings Tolya and Tamar are of few words, but they have some pretty surprising skills that come in handy throughout their adventures. And then there's the Sturmhund, who is a pirate/privateer/kind of smarmy jerkface that you wind up loving because he's the best. He's sassy and sarcastic and provides for excellent bantering, and, oh yeah, he's got some epic secrets, too. If you're not firmly on Team Mal, and Team Darkling squicks you out because he's a evil sociopath, please consider Team Sturmhund for your character shipping loyalties. Like before, I don't completely buy the epic romance that is supposed to be Mal and Alina. They have a lot of shared history, and they make for excellent banter, but there's something about him that I just find flat. He constantly wants Alina to just give up on being the Sun Summoner and give up on doing her part to save Ravka, so they can just settle down somewhere together and live normal lives. He's not manipulative like the Darkling, but he definitely makes what he wants clear to Alina, and then pouts when he doesn't get his way. I have my own opinions on what Alina should do in regards to her personal life, but they're all probably a little too strategic and cutthroat for what is a YA book. One last note, there are some POV scenes from the first book, from Genya's perspective, available on Facebook (you just have to "like" the page to get access). While they are technically set before Siege and Storm, and aren't really spoilers per se, I'd still recommend reading them after you've read the new book -- they're much more poignant that way. Did Siege and Storm have the magic that the first book had? Yes and no. I adored this book, but it did take me a bit to get there. I am not sure if I just didn't have time to read it like I did with Shadow and Bone (and I tend to struggle more with books that I have to read in pieces). The beginning was strong but then started to lag. It wasn't boring, but I supposed I am so used to high action scene after high action scene that it was a bit of a lull. I do think, though that at about the 60% mark it picked up really well. I have so many feelings about Alina and Mal (and the Darkling). I am a little confused because for the last six months all I have heard is- the Darkling isn't in this, the Darkling isn't in this... but he was and throughout the whole story. I thought that the drama between the three was a little predictable but enjoyable to read nevertheless. I agree with Sarah, I was a little frustrated because this book absolutely followed the "oh this is the second book there must be drama to tear the lead romance apart", but I honestly enjoyed the little twist she added in with the Darkling. So I am reading, and enjoying it and then the end came. Leigh Bardugo, you rocked my socks off with that ending. So much drama, so many feelings! I cannot wait for book three! Please? Can I just have it right now? There were a few dull spots for me, but overall there is no sophomore slump for Siege and Storm, this is an outstanding sequel to my favorite series. And oh man... all the emotions between the Darkling and Alina and Mal. Whew. I am one of the people who didn't really think the Darkling was in this book-I know he was there but he didn't have the presence he did in S&B and honestly I missed him although I still like Mal, the good guy. This sounds like a book I would really enjoy. I like the little video touches you have on your blog. They are cute.